The hallmark of a great gift? You want to keep it all to yourself. With our new SimplyScrub holiday gift set, featuring pretty little jars of our coffee, chocolate and soursop scrubs all wrapped up in a festive little package, we won’t blame you if this is one gift you keep in the “me” pile. Vitamin E soothes eczema and psoriasis, and delivers a healthy dose of antioxidants to the skin, which can help boost collagen production and promote new skin cell growth. You want this over-achiever on your team. 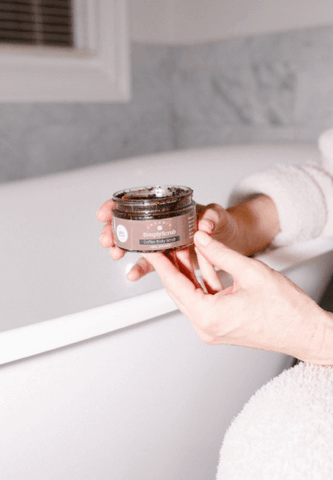 Each scrub is made with only the finest natural, organic, and chemical-free exfoliators and moisturizers to smooth, brighten, and protect your skin from everything the outside world may throw at it. Plus, the intoxicating chocolate, coffee, and soursop scents turn your daily shower into a major aromatherapy session (talk about relaxation). So, whether you give this gift away or keep this holiday (or anytime) indulgence all for yourself, the gift of great skin is definitely something to celebrate. Cheers.